They seem to like a grand and glitzy foyer in Hong Kong. The Harbour Plaza is no exception. Lots of marble. Lots of glass. Impressive views. And a chef who makes omelettes right in front of you, on demand. 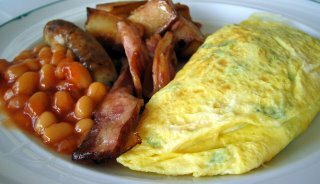 Quite a decent omelette, too. It may look like lunch, but this particular club sandwich contained both egg and bacon, so I'm calling it breakfast. And it was of much better quality than I would have expected for a venue boasting such magnificent views across the Hong Kong skyline and harbour. 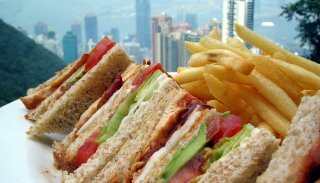 If you're passing through Hong Kong, I highly recommend a visit to Cafe Deco, at the top of the Peak Tram, Tel +852 2849 5111. I was too gutless to go looking for dim sum by myself. 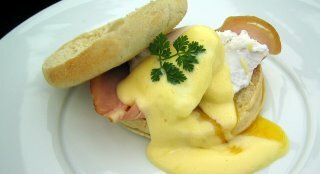 I read a review in Time Out that raved about the fact that "Tom’s legendary eggs benedict/florentine are lovingly prepared with real hollandaise and perfectly poached eggs". They forgot to mention the legendary raw muffins on which those perfectly poached eggs are served. Or the fact that when you specifically order your benedict on toast in order to avoid said raw muffins, they will be served on raw muffins anyway. Did I mention how much I hate raw muffins? If you like raw muffins, get yourself down to Tom's Deli, 226 Westbourne Grove, Tel +44 20 7221 8818, and join the queue. It's a pity they muffed up my muffins, because otherwise it was an impressive eggs benny. 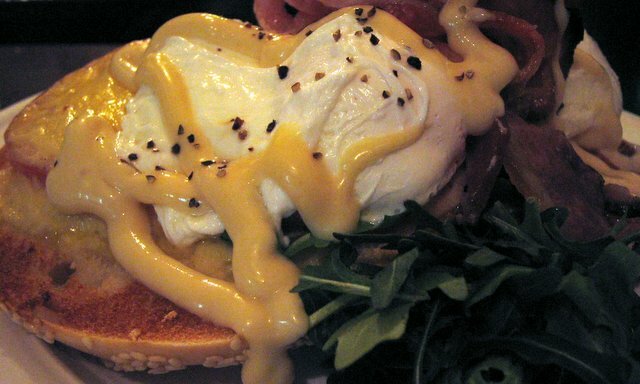 Nicely poached eggs. Delicious, meaty slabs of Parma ham. 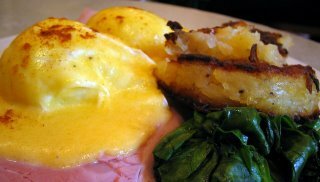 Good hollandaise, even if they were too lazy to clarify their butter. 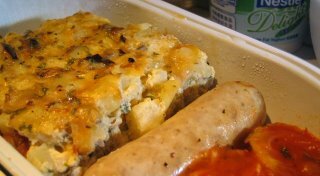 And an excellent side of hash browns, all soft and mushy in the middle, as they should be. 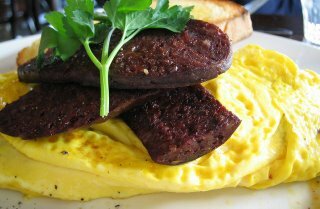 The Full English wasn't bad, with the usual suspects of eggs, bacon, pork sausage, black pudding, mushrooms and tomato on toast. But I would have thought a true "Full" English would have beans as standard, and it's always annoying when the menu promises "sausages" and they only serve one. If you prefer a lighter breakfast, Tom's does half a pink grapefruit for £3.75, or maybe a pain aux raisins for £1.95. In the end, despite my annoyance at the whole muffin thing, I walked away quite impressed by the skills of our waiter. I expressed my outrage. He copped it sweet. He didn't give me any lip. He didn't make weak excuses. And I respect him for it. A feature of British Sausage Week this year will be the search for the Supreme Sausage Sarnie, so be sure to write "Sausage Week" very clearly in your diary (or your Blackberry) for every day between 30 October and 5 November, 2006. 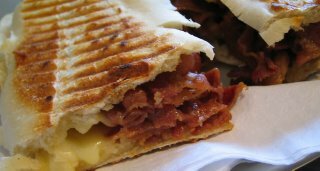 This morning I did a bit of pre-Sausage-Week research, and sampled the wares at Jonathan's Sandwiches, 17 Cullum Street, London, Tel +44 20 7626 0136. 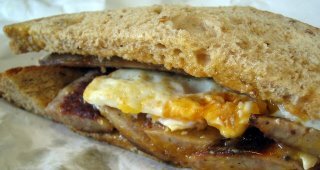 They do a very juicy sausage and egg sarnie, with perhaps a little too much runny yolk for the thin granary bread. 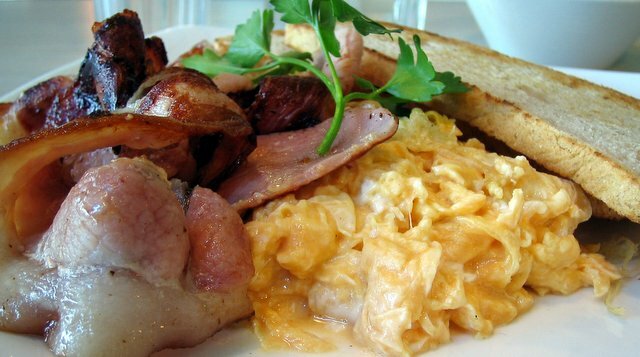 But the flavours are excellent, and as long as you don't drip brown sauce, yolk and grease all over your trousers, it makes for a finger-lickin' breakfast-on-the-run. 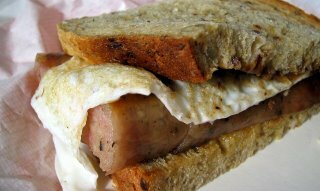 I love a nice sausage and egg sarnie. The perfect fuel for a busy day. And I was most impressed with the Birley's version of this simple English classic. Soft, fresh "granary" bread, juicy cumberland sausage, well fried egg and a slurp of brown sauce. All whipped together by a very professional looking chap in a big chef's hat. You'll find this Birley's outlet (it seems to have have evolved into a chain... McBirley's, if you will) just off Fenchurch Street, around the corner from Lloyd's. Actually, I just checked, the official address seems to be Fountain House, 130 Fenchurch St, London, Tel +44 20 7929 3603. You won't find a more striking spot for breakfast. But, unfortunately, you won't get much of a breakfast up the Gherkin, 30 St Mary Axe, London. I ordered eggs benedict. I got egg benedict. One lonely egg. On a raw muffin. With a muffin garnish. Despite some rather spiffing names - "Irish back bacon sandwich" and "Appleton pork sausage sandwich with caramelised red onion and mustard" - I fear the food is all rather ordinary. I'm told the bacon sarnie tasted good, but it wasn't much to look at. Just a couple of bits of mangy-looking bacon in a toasted baguette. Pastry or toast might be safer options. And maybe a glass of pomegranate juice? Did I mention the striking views? 360 degrees of London skyline for your viewing pleasure, weather permitting. And you even get to sit down in style. No flimsy little cafe chairs here. Just a nice selection of Arne Jacobsen Swan Chairs, in a lovely shade of grey. 12/20 "nice view, weather permitting"
What to do when the River Cafe at Putney Bridge tube stop is bludging off on Summer holidays? Duck into Nancy's and pick up a breakfast sandwich of some form or other. 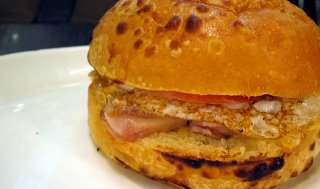 In my case, a very English bacon sandwich (an abundance of cripy, salty, greasy curls), dressed in Italian gear (grilled ciabatta), with a French twist of oozy molten brie. A very London experience, really. English, with euro trimmings, served up by a nice blonde from the Czech Republic. Cramped and quirky is the new black. Or the new cool. Or something like that. And it doesn't get more cramped and quirky than Jungle Juice, in Melbourne's uber-lane, Centre Place, Tel +61 3 9639 8779. The menus are glued to the inside of recycled Little Golden books, and the food simple and tasty. 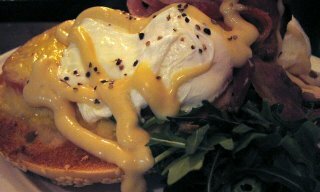 I was very happy with my poached eggs and bacon with jungle juice (swirls of mayo). But the toasted bagels were almost impossible to cut. You really need an electric knife, or a jack-hammer, or a machete, to hack through the crusts. I really don't like slimy scrambled eggs. I don't like bacon with strings of rubbery fat that make it impossible to extract the meat. And I don't like it when two dry slabs of boring-looking toast are dumped on the side of my plate like a garnish. This morning I scored the trifecta at Automatic, in the Crown complex, 8 Whiteman Street, South Melbourne, Tel +61 3 9690 8500. The view across the river is nice. The waiter was friendly. But the food was awful. Especially the skanky eggs.